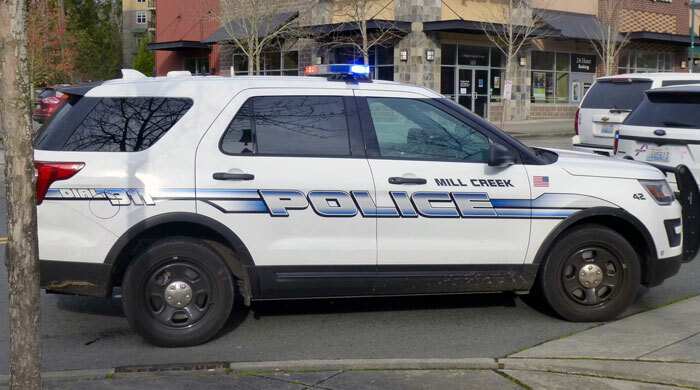 According to the latest Mill Creek Police Blotter, a total of 456 responses were reported the week of January 25th to January 31st, 2019. 09:02:34 - 12900 BLK 19TH AVE SE: Officers contacted a suspicious vehicle in the 12900 block of 19th Ave SE. Drug related activity had been occurring. The vehicle was impounded pending a search warrant. Investigation ongoing. 14:00:22 - 14900 BLK BOTHELL EVERETT HWY: A Mill Creek woman, who resides in the 14900 block of SR527, reported that a known subject had stolen several personal checks and forged them with her name in order to obtain cash. 07:20:58 - 13500 BLK NORTH CREEK DR: Officers investigated a domestic disturbance, which occurred near the 13500 block of North Creek Drive. 08:42:41 - 3300 BLK 150TH PL SE: Officers responded to a death investigation in the 3300 block of 150th Pl SE. A 58 year old woman from Leavenworth died of a suspected overdose. 14:28:51 - 16300 BLK BOTHELL EVERETT HWY: A Lynnwood resident accidently left her credit card at a local ATM near the 16300 block of SR-527. A good Samaritan found the credit card and submitted it to MCPD. 15:19:59 - 15728 MAIN ST: A RCMP Constable requested identification verification on a subject she had in custody at the Blaine border crossing. Mill Creek Officers were able to provide the subject's true name and date of birth, which revealed an outstanding felony warrant for his arrest in Washington. 00:25:50 - 3300 BLK 132ND ST SE: An officer responded to a report of a lost wallet in the 3300 block of 132nd St SE. A Bothell male reported he lost his wallet when it fell out of his pocket and then someone stole it. Follow-up required. 01:00:30 2400 - BLK 148TH CT SE: Officers responded to a cold vehicle prowl in the 2400 block of 148th Ct SE. An unknown suspect stole a wallet and other personal property from an unsecured vehicle. 01:07:40 - 1200 BLK MILL CREEK BLVD: Police responded to a report of a physical domestic in the 1200 block of Mill Creek Blvd. Subsequent to investigation, an adult male was arrested and booked into Snohomish County Jail for DV Malicious Mischief 2nd Degree, DV Assault 4, and DV Interfering with Reporting of Domestic Violence. 09:30:08 - 13400 BLK DUMAS RD: Officers responded to a death that occurred near the 13400 block of Dumas Rd. 17:02:48 - 2000 151ST WAY SE: Mill Creek officers responded to a domestic dispute that occurred near the 2000 block of 151 Way SE. 19:56:05 - 15000 BLK MAIN ST: An officer responded to a theft report in the 1300 block of 138th St SE. A Mill Creek resident reported his wallet had been stolen and his credit cards had been used to make fraudulent charges. Further investigation required. 20:33:02 - 13100 BLK 21ST DR SE: Officers stopped a vehicle for a registration violation. A 34 year old Everett male was cited and released for failing to transfer title within 45 day. 04:29:16 - 13900 BLK 25TH AVE SE: Officers responded to a report of a dumped stolen vehicle in the 13900 block of 25th Ave SE. A Mill Creek male reported an unknown vehicle was parked in his driveway. The unknown vehicle was a reported stolen vehicle. 04:44:47 - 13500 BLK 28TH AVE SE: Officers responded to a cold vehicle theft in the 13500 block of 28th Ave SE. A Honda Accord was stolen from a driveway. 04:49:58 - 4700 BLK COLBY AVE: Mill Creek K9 Unit assisted the Everett Police Department with a commercial burglary in the 4700 block of Colby Ave.
16:10:12 - 16100 BLK BOTHELL EVERETT HWY: An unknown person vandalized a cabana near the 16100 block of SR-527. 03:03:13 - 12900 BLK 19TH AVE SE: Officers stopped a vehicle for a registration violation in the 12900 block of 19th Ave. SE. Charges for DWLS 3rd Degree to be forwarded for a 37 year old Bothell male. 05:17:18 - 2300 BLK 132ND ST SE: Officers stopped a vehicle for a registration violation in the 2300 block of 132nd St. SE. A 30 year old Everett female to be cited for DWLS 3rd Degree. 09:26:10 - 600 BLK 128TH ST SE: Officers arrested a warrant subject in the 600 block of 128thSt. SE. 09:32:20 - 13500 BLK BOTHELL EVERETT HWY: An officer responded to a cold vehicle prowl in the 13500 block of Bothell-Everett Hwy. 10:11:46 - 12100 BLK ANDREW SLATER RD: Officers contacted an occupied suspicious vehicle in the 12100 block of Andrew Slater Rd. A field investigation was conducted. 11:45:39 - 1100 BLK 164TH ST SE: An unknown person spray painted a Mill Creek resident’s vehicle near the 1100 block of 164th St SE. 12:25:18 - 3600 BLK 132ND ST SW: Officers observed a known subject driving who was DWLS 1st. Attempts to locate the subject were not successful but charges have been sent to the prosecutor’s office. 15:26:06 - 3000 BLK 138TH ST SE: Officers responded to a report of found property in the 3000 block of 138th St SE. A female found opened property by the mailboxes. An attempt to contact the owner of the mail was unsuccessful. 16:05:07 - 1500 BLK 132ND ST SE: Officers arrested a subject in the 1500 block of 132nd St. SE who was attempting to cash a forged check. Click on this link to see the January 25th to January 31st, 2019, Mill Creek Police Blotter.